- WWC Tag-Team Titles Tournament (June 29, '86) = Al Perez & Sweet Brown Sugar lost in the first round to Eric Embry & the Crusher. The Rock-n-Roll RPM's won the tournament. - WWC 13th Anniversary Show (September '86) = Perez pinned Barry Windham. - WCCW Texas Tag-Team Titles Tournament (June 29, '87) = Perez & Brian Adias lost in the first round to the eventual winners, Tony Atlas & Skip Young. - WCCW Labor Day Star Wars '87 (September 7) = Perez retained the WCCW World Heavyweight Title, winning, via Countout, over Kevin von Erich. - WCCW 4th Cotton Bowl Extravaganza (October 17, '87) = Perez, as the WCCW World Heavyweight Champion, was beaten by Kevin von Erich. However, due to outside interference, the title was returned to Perez. - WCCW Thanksgiving Star Wars '87 (November 26) = Perez, as the WCCW World Heavyweight Champion, lost a "Non-Title Texas Death" Match to Kevin von Erich. 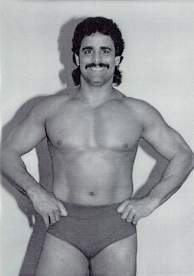 Later on, Perez lost a "Non-Title" Match to Kerry von Erich. - WCCW Christmas Star Wars '87 (December 25) = Perez stayed the WCCW World Heavyweight Champion, winning a "Steel Cage" Match over Kerry von Erich. - NWA 3rd Annual Jim Crockett Sr Memorial Tag-Team Tournament Cup (April '88) = Perez & Larry Zbyszko took down Joe Cruz & Ricky Santana, then fell to Bobby Fulton & Tommy Rogers. Lex Luger & Sting won the tournament. - NWA Clash of the Champions II (June 8, '88) = Perez lost, via DQ, to Nikita Koloff. - NWA Great American Bash '88 (July 10) = Perez, Ivan Koloff, Mike Rotunda, & the Russian Assassin lost a "Tower of Doom" Match to Jimmy Garvin, Ronnie Garvin, Steve Williams, & the Road Warriors. - NWA United States Tag-Team Titles Tournament (October/December '88) = Perez & Larry Zbyszko lost in the first round to Eddie Gilbert & Ron Simmons. The Fantastics won the tournament. - NWA Clash of the Champions XII (September 5, '90) = The Black Scorpion lost to the NWA World Heavyweight Champion, Sting. - Tri-State Wrestling Autumn Armageddon (September 15, '90) = Perez & Austin Idol fought to a Double Countout against Chris Adams & Kevin von Erich. - Tri-State Wrestling Winter Challenge II (March 2, '91) = Perez pinned Stan Lane. - Tri-State Wrestling Spring Spectacular II (May 18, '91) = Perez & Buddy Landel won, via DQ, over the Fabulous Ones. - GWF North American Heavyweight Title Tournament (August '91) = Perez defeated the Handsome Stranger, John Tatum, Austin Idol, and Terry Gordy, then fell in the finals to the Patriot. - AJPW Real World Tag-Team League '91 (November/December) = Perez & Dory Funk Jr competed in the league, which was won by Terry Gordy & Steve Williams.